Very unusual antique solid carved Wooden Buddha subduing Mara on stepped throne pedestal, natural aged patina, good condition, 18/19th Century, Cambodia. Size: H. 32" x W. 13" at base x D. 7"
FIVE very rare and delicate 19th Century Rosewood and Marble miniature tables, ideal for placing nice art objects such as Porcelain, Statuettes or a Bonsai. 19th Century China, size:H. 10.5cm x L. 26cm x W.18cm. 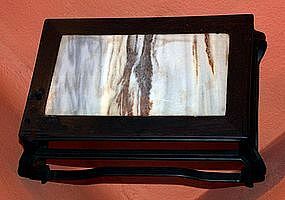 Good condition (collection of 5 pieces, will sell separately) and price quoted is for each. Attractive 18K. White and Yellow Gold Ring (12.73 gr.) 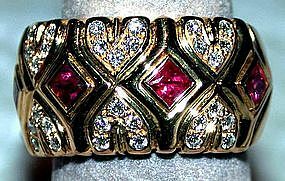 set with 4 genuine princess-cut Burma Rubies @ 0.66 ct.,and 30 brilliant Diamonds @ 0.34 ct. total weight. New. 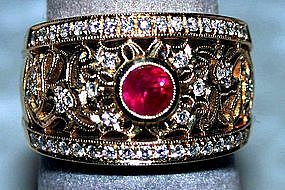 Fuchsia-colored genuine Burma Ruby @ 2.27 ct. set with 2 baguette Diamonds @ 0.27 ct. total weight, 18K White Gold Ring (6.96 gr. ), new. TOURMALINE, YELLOW SAPPHIRE, GREEN GARNET Earrings 18K. 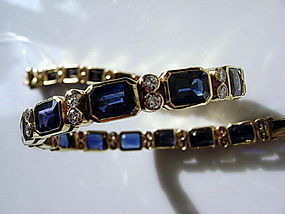 Very unusual 18K. 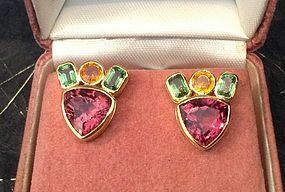 Gold Earrings adorned with 2 pink Tourmalines @ 5.10 carats, 2 Yellow Sapphires @ 0.79 ct. and 4 Green African Garnets @ 1.22 ct, total weight. Bezel setting, for pierced ears only. Pigeon blood genuine Ruby @ 1.00 ct., pear shaped, set with 2 pear shaped Diamonds @ 0.38 ct.. 1 Brilliant cut Diamond @ 0.09 ct., 12 Brilliant cut Diamonds @ 0.15 ct. total weight. Solid 18K. White Gold (4.98 gr). 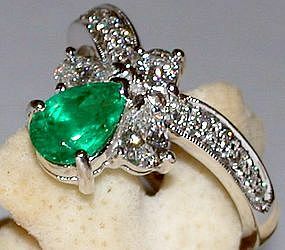 This design is also available in Ceylon Blue Sapphire (item # 570584) as well as in Colombian Emerald (item # 570619). Thank you. Solid 18K. 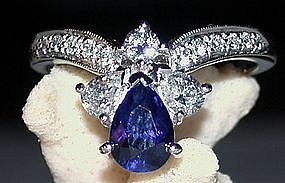 White Gold Ring set with one pear shaped Genuine Cornflower Blue Ceylon Sapphire @ 1.34 ct., 2 pear shaped Diamonds @ 0.37 ct., 1 Brilliant cut Diamond @ 0.09 ct. and 12 Brilliant cut Diamonds @ 0.15 ct. total weight. We also carry this same design in Colombian Emerald as well as in Pigeon Blood Ruby (please look under "Rings" on our website) Thank you. 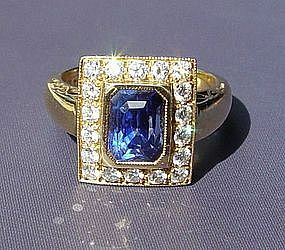 Very attractive genuine Ceylon Blue Sapphire, octagon cut, 3.05 carats, surrounded by 18 diamonds total weight 0.55 ct., set in 18K Yellow Gold, new, sides are very delicate cut-out lace/filigree work. New. Avant-garde and very striking 2-tone gold ring, set with one genuine Colombian Emerald @ 0.63 ct. as well as 52 diamonds @ 0.54 ct. total weight, 18K White and Yellow Gold, new. All our stones are genuine and guaranteed. Solid 18K. White Gold Ring set with one Genuine Colombian Pear shaped Emerald @ 0.80 ct., 2 Pear shaped Diamonds @ 0.37 ct., one Brilliant cut Diamond @ 0.09 ct and 12 Brilliant cut Diamonds @ 0.15 ct. 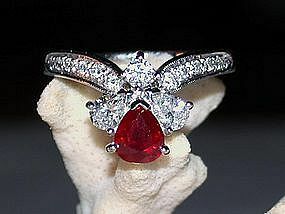 This design is also available in Blue Sapphire as well as Pigeon Blood Ruby, please look up "Rings" on our website. 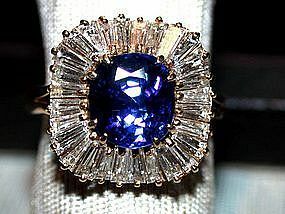 Stunning genuine Ceylon Cornflower Blue Sapphire Ballerina Ring, cushion shaped, @ 3.75 ct., surrounded with 28 Baguette Diamonds @ 1.79 ct. set in 18K. Yellow Gold. 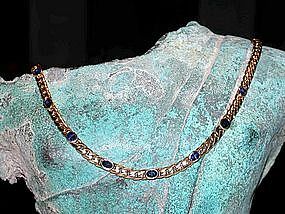 Genuine Ceylon Blue Sapphire Necklace set with 9 sapphires (total carat weight 4.76ct. ), set in solid 18K Yellow Gold (50.33 grammes), all hand made. We also have the same necklace set with 7 genuine pigeon blood rubies ( for details please go to our item # 675240 in this catalogue). 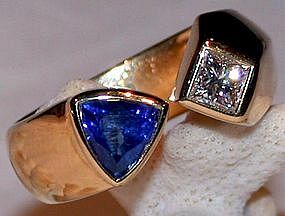 Solid 18K Gold ring set with one genuine Cornflower Blue Ceylon Sapphire @ 1.07 ct. as well as one Princess-cut Diamond @ 0.29ct, new, stunning! 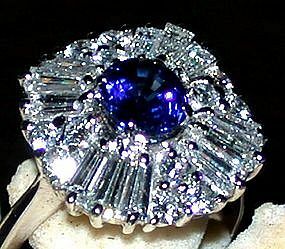 Most attractive Ballerina genuine Cornflower Blue Ceylon Sapphire/Diamond Ring set in 18K White Gold, carat weights available upon request, new. Our own design "Arabian Nights" 4 sky-blue sapphires @ 4.29 ct total weight, 4 yellow ceylon sapphires @ 4.89 ct. total weight & 54 brilliants @ 1.49 ct. total weight. These earrings can be worn with clip and/or as pierced version, 18K Yellow Gold. 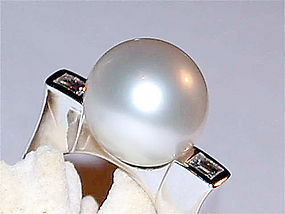 All our gemstones are guaranteed genuine. New and very special/unique!